Introducing the FZO-1 Fuzzy Octavulator. Get the classic octave tone of the sixties without the noise and instability. Our octave up is coupled with the killer tones of our Fuzzulator pedal, giving you a combination that guarantees some totally amazing sounds. Using a completely new analog circuit to generate the octave sound we have eliminated the problems found in the older designs of our competitors. 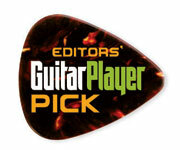 It delivers a smooth, musical and usable sound through a much greater harmonic range. Like all Demeter pedals we take classic pedal concepts and redesign them to make them perfect. The unit has controls for Fuzz, Volume and Tone, as well as a Tight and Loose switch. Both the Fuzz and Octave effects can be used either in combination or independently of each other. As with all Demeter products, the FZO-1 Fuzzy Octavulator is handmade here in the U.S.A. using all locally manufactured components when available. Coupled with the Fuzz circuit, the octave takes on a whole new dimension, with an extremely focused and distinct Hendrix-type sound. The beauty of this pedal is it's versatility. Unlike many octave-fuzz pedals, which give you a single sound, controlled by one footswitch, our pedal gives you the option to use the octave and fuzz circuit completely separate from one another. 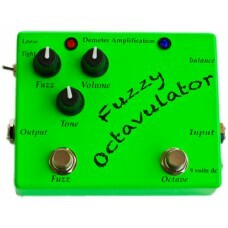 The fuzz circuit on this pedal is identical to our FUZ-1 Fuzzulator. There are four controls on the unit: fuzz, tone, volume and a mode switch which alternates between tight or loose fuzz types. The unit also features two separate foot switches (octave and fuzz) and an LED to indicate effect operation. On the side of the unit, there is a trim pot to set the overall gain. Power supply: 9 volts DC. Either external or internal. For internal power, use a 9 volt battery. To access, remove the four screws on the sides of the unit and pull apart. Note: battery must have at least 7 volts for unit to work! External power supply using standard Boss type power supply, 9 volt DC regulated (100 milliamp or more).